utdoor rink, the pressure of the wind has to be taken intoaccount and the skater must be more economical of his strength. The large, flowingfigures should be commenced against the wind, so that the second half of the figure ob-tains the advantage of the wind, and thus becomes equal to the first half which has theinitial power. : Long combinations of figures should be placed, if possible, at right anglesto the direction^of the wind. Do not hurry under the impression that you are getting swing. Do not scramblefrom one figure to another, but skate each figure to the end and in a precise manner. Special movements such as jumps, toe-spins, etc., may be duplicated. This empha-sizes the figure, and lends the impression that the skater is very safe. 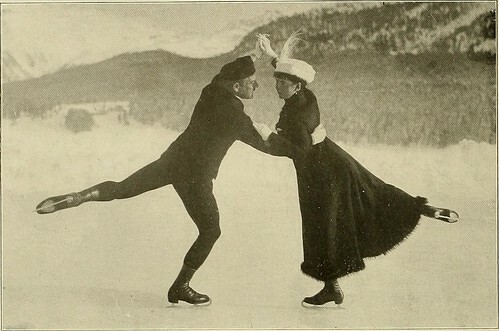 The music chosen must be suitable for the programme, and the skater must en-deavour to keep perfect time without losing the characteristic style of his skating. Most march and other dance steps can, when perfected, be skated in time with anymusic.